Quarterfinal Breakdown (Part 1): Can TSM do the impossible and take down Samsung White? On Friday October 3rd, TSM will take on Samsung White in the first of four Quarterfinal Best of 5’s taking place in Busan, South Korea this weekend. For North American Fans, and those of TSM, this is a nightmare scenario. Samsung White excels in the laning phase, utilizing strong individual mechanics and Dandy’s jungle pressure to win every lane. Once the mid game rolls around, White utilizes these advantages to secure objectives with well-coordinated team fights based on superior rotations. SSW excels at catching their opponents off guard, and like most top tier Korean teams, know how to close out a game. Their only real weakness is a tendency to step off the gas against weaker teams and play around with their food. A passive laner, Pawn prefers farm-heavy, team fight oriented Mages, and typically just tries to survive in lane. But don’t mistake that preference for an inability to play Assassins. Pawn is preficient on a wide variety of Champions, and is reknowned in Korea for having earned multiple Solo kills against Faker. Think of him as the master artist who prefers a specific style, but when forced to use another, is still better than anybody else. Looper has gotten somewhat lost in the fog at the World Championship, with the majority of the attention given to Mata, Imp and Pawn. But for a player who excels at AP Tanks and Mages, the Meta couldn’t be more favorable. Throw in the fact that Looper is the most intelligent teleport user in the world, and you have a player who is just as capable of dominating a match as his more famous teammates. Most western fans remember him as the player who claimed that no Western Team would defeat a Korean team at last year’s Worlds, only to watch his own Team lose four such games. Dandy returns to the World Stage better than ever, and ready to prove his worth, with a notable absence of trash talk. On a team of giants, Dandy is the straw that stirs the drink in the early game. Expect him to utilize his large champion pool to get the picks he wants, and exert massive pressure allover the map. In the conversation for best ADC in the world, Imp is one of the best, and most reliable players in the world at his position. An exceptionally strong laner in the Chinese mold, Imp combines exceptional mechanics with overwhelming pressure in order to dominate his lane opponent. Like every other player on SSW, Imp has an exceptionally pool of Champions that he’s not just proficient on, but masterful. The discussion for best player in the world has historically included solo laners, and little else. But in Mata, we have a player so exceptional at he’s reduced the discussion to a contest of two. And like Faker, it’s Mata’s over-arching understanding of the game on top of his mechanics that sets him apart from the rest of his position. A maestro when it comes to vision control, Mata ensures that his team always has full knowledge of the enemy’s movements in order to make the best possible decisions for any given situation. TSM lives up to their name, playing a mid-focused style that revolves around Amazing getting Bjergsen rolling, while Dyrus sits on an island in the top lane, and WildTurtle and Lustboy just try to survive the laning phase. Dyrus remains TSM’s emotional center, and while he appears to have shaken the tendency to go on tilt when camped, Dyrus’s performance is typically a good indicator of whether TSM will win or not. When given a lead, TSM does a good job of closing out the game, even if they have a tendency to be a little too passive in doing so. In Best of 5’s, TSM has historically gotten better as the Series goes on, preferring to make adjustments between games. This stands as both a weakness and a strength, as the inability to make profound mid game adjustments could prove costly against SSW. A former EU prodigy, Bjergsen really began to come into his own as the year went on. When the assassin meta fell to the way side between splits, it took Bjergsen a while to adjust. But once he did, his exceptional play on a large variety of Champions carried TSM all the way through their Regional Playoffs to the number one seed. Bjergsen has two primary weaknesses. While seemingly over-confident, this facade masks a player who has been historically prone to second-guessing himself, though he appears to have made significant gains in this area. On the other hand, it’s pretty clear that his role as shot-caller sometimes detracts from his individual performance. There’s a reason Korean teams rarely place this responsibility on their mid laners. His strengths lie in an exceptionally large Champion pool, and a propensity for the solo kill. Undoubtedly the most important player on TSM, any chance of an upset rests on his able back. As one of only two players to play in all four World Championships, Dyru’s longevity stems from his ability to adapt to any Meta and remain a top player within his region at the position. While previously known for easily going on tilt when camped in International competition, Dyrus has shown remarkable improvement on this front in just the last few months. His strong showing throughout the Summer Playoffs, and in the Group Stage is a boon for a TSM team that is going to need all the help it can get. It helps that the Meta sits right in his wheel house, with favorite champion Rumble one of the surprise new picks coming out at Worlds. One of Dyrus’s biggest strengths is his ability to not only survive, but thrive in a lane swap. This strength is what originally led to the above-mentioned weakness, as Teams were forced to 3-man dive Dyrus to keep him out of the game. But opposing teams beware, it’s not unusual for Dyrus to come out of such dives with a kill or two himself, as he excels at prioritizing the right targets. Amazing’s strengths and weaknesses are well known. He has a small, well-defined pool of Champions that he excels on, making him an easy target for bans. His Elise and Lee Sin can be game-changers, but his secondary picks are hit or miss, and miss more often than they hit. He’s recently picked up a few more Champions, but the fact remains that his impact is lessened when he doesn’t get either of his two primary Champions. Amazing’s other primary weakness is predictable jungle pathing that he rarely deviates from. As TSM’s mid-centric play style is well known, better jungler’s will be able to take advantage of Amazing’s predictability to counter-gank wherever Amazing reveals himself. This could prove particularly devastating against a player who specializes in Rengar. Amazing is going to have to step it up big time if TSM is to have a chance of pulling off the upset. He has recently shown a willingness to go for the big play, and while he isn’t always successful, this deviation from his previous play style is a welcome change from his previously stagnant play. The lone bright spot for TSM at last year’s World Championship, WildTurtle has struggled heavily in lane since TSM parted ways with former support player, Xpecial, whose strong synergy with Turtle appears to have been covering up some severe deficiencies in WildTurtle’s game. It’s hard to pin point a single reason for Turtle’s struggles, but it appears to be an inability to balance csing with trading, something most of the top ADC’s in the World excel at. This leaves Turtle with either a large CS deficit, or being frequently forced out of lane due to taking excessive harass. TSM has attempted to mitigate this weakness by putting Wild Turtle on safe laners with strong scaling, allowing Turtle to remain relevant throughout the course of the game. Thus far, this strategy has proved effective against all but the best ADC’s, as Turtle retains the strong team fighting ability he showed throughout last year’s World Championships. Continuing the above refrain with Amazing, Wild Turtle is going to have to step up his game if TSM is going to have a chance, otherwise TSM may lose the bot lane so hard that Bjergsen and Dyrus’s performance is irrelevant. Lustboy has revolutionized TSM’s vision control since taking over the support role from Gleeb. This improvement alone is the main reason why TSM has gotten this far, as the improved vision has made it easier for Bjergsen to make the right choice in his shot-calls, quickening his growth in the role. This alone justifies Lustboy’s inclusion on the team. And while WildTurtle have had a slow start in forming the necessary synergy between ADC and Support, they’ve improved by leaps and bounds since the final weeks of the LCS, with Lustboy frequently saving WildTurtle from himself with pin point bubbles. Lustboy’s proficiency on Nami is World Class, and stands as one of the few absolute must bans against TSM (though the likes of SSW might believe themselves above needing to ban any specific Champion to beat TSM). Make no mistake, this is SSW’s series to lose. If Samsung White plays at their best, TSM really has little hope of winning. It would likely take the very best performance of each member of TSM’s career to pull off the upset. Samsung White is just that good. It’s to the point where even dropping a single game to TSM would be an upset. Optimistically speaking, Bjergsen/Pawn and Dyrus/Looper is a wash, while Lustboy/Mata, Amazing/Dandy and Imp/WildTurtle are all massive advantages for SSW (though Lustboy is probably the most competitive of the three depending on Champion). It’s hard to even think about how someone would game plan for White, but we’re going to try. Let’s tackle bans first. Thresh is probably a must ban against Mata, as he will likely destroy Wild Turtle with it. TSM should also ban Twitch, as they have little experience playing against the style of Twitch played in Korea. Attempting to ban out Pawn is an exercise in futility. That leaves one ban for the likes of Nidalee, Maokai and Alistar. That makes playing from Red side especially difficult for TSM. I also think TSM is going to need to change up their game plan a little bit. TSM will not win if something isn’t done about the huge gap between Wildturtle/Lustboy and Imp/Mata. This may require a re-prioritization of jungle pressure. TL;DR Bjergsen’s going to have to win lane on his own, while Amazing camps the living hell out of the bot lane. The problem is, even if this works, it will only work for one game. It’s possible that a change in Amazing’s jungle pathing catches SSW off-guard for that one game, but they will adapt for every game afterward. And even then, all that does is ensure TSM escapes the laning phase without a massive deficit, they still have to win team fights. The truth of the matter is, it’s unlikely TSM will be able to win many of those straight up considering White’s skill in team fights, so they are going to have to do what C9 did against NJWS and utilize exceptional map movements to throw White off guard. This allows them to avoid those straight 5v5 fights they’re unlikely to win. 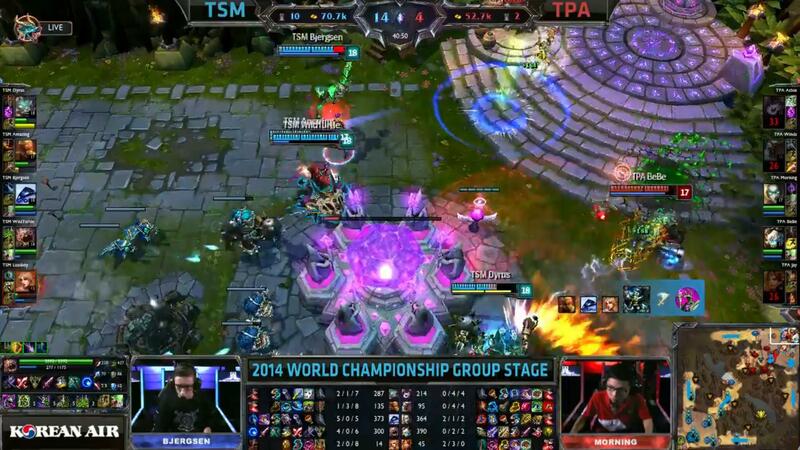 So far, TSM has yet to show themselves capable of such high-concept strategy. Make no mistake, there’s a reason SSW is such a heavy favorite here. Any hope TSM has of winning is going to rely on these three things. SSW underestimates TSM, forgoing banning Amazing and Bjergsen’s power champions, and allowing TSM to get the comp they want. TSM changes up their play style, catching SSW off guard. Bjergsen playing out of his mind. WildTurtle and Lustboy not dying in lane to Imp/Mata. Dyrus continuing his recent top lane performance. It’s possible that all three of these things could happen, and TSM not win a single game. SSW is probably the most complete team of League of Legends history. Where past power teams had a single star player, with their entire team built around them like Maknoon/NJBS and Faker/SKT1, SSW is strong across the map. This is David vs Goliath, and you have to assume SSW remembers the embarrassment of last year’s worlds, and will take every single game seriously. Just play to their normal level of strength, and take TSM seriously. SSW has only ever run into trouble against foreign teams when arrogance led to a lack of preparation. If Samsung puts in their due diligence and plays like they’re capable of, the upset just won’t happen. That’s what happens when you’re the best team in the World. That said, there are definitely some power picks that SSW should remove from TSM. Picking or Banning away Lee Sin takes away Amazing’s best champion, and goes a long way to mitigating any jungle pressure he has, regardless of which lane he’s ganking (though I wouldn’t be surprised if we saw Amazing pick Nunu, and he and Lustboy focus on playing the vision game). Taking Nami away from Lustboy removes by far his best support from play, and takes away that protective blanket from WildTurtle, though it’s also possible that Mata is confident that he can just pick Braum into it and negate Lustboy’s impact. However, the most important pick for TSM is without a doubt Xerath. TSM’s best chance for success is likely a poke-oriented disengage comp, and Bjergsen’s Xerath is critical to that comps success. On the flip side of that, TSM’s favored protect the Tristana comp seems unlikely to work, as it would mean TSM is gambling on Turtle and Lustboy escaping the laning phase without a large deficit. That’s a dangerous proposition, as you have to actually reach the late game for such a comp to be effective. I believe a little bit in Apple Pie, so I do think TSM will take a game off of Samsung White. I’m going with Samsung White 3-1, but with TSM earning a lot of respect.